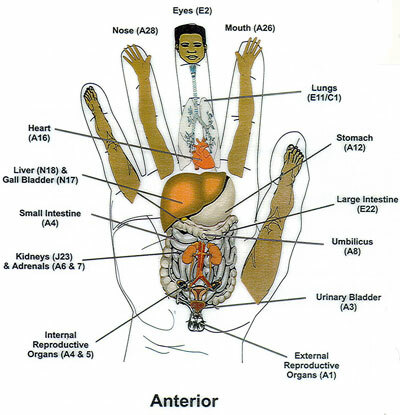 The Kidney Meridian Chart below is one of the twelve major meridians used in acupuncture, acupressure and reflexology. A large meridian wall map showing all 12 meridians is included in the MIR Home Study Reflexology Package. This definitive chart is offered by MIR. through provision by Dr. Inga Dougans, DR, of the International School of Reflexology and Meridian Therapy. Thank you Dr. Dougans. the K1 Point on the bottom of both feet. MIR has placed equal emphasis on the value and use of traditional USA Zone Therapy Chart system and the 12 Meridian Chart system, both of which place importance of the reflex/meridian points in both the feet and the hands. The K1 Meridian point (the only meridian origin on the bottom of the feet) and the Solar Plexus Zone point are two descriptions of the same (overlapping) reflex area ... both holding a reputation for dramatic healing response. 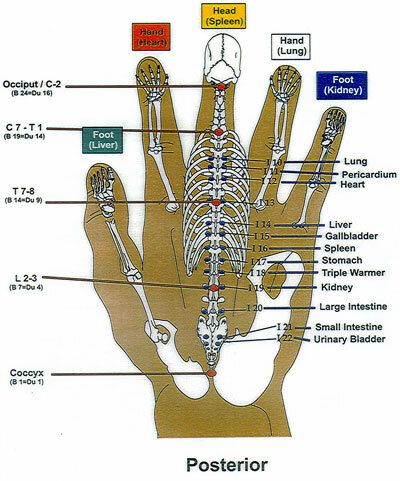 After 18 years of percussion activation to this specific reflex point area, Brinkerhoff put forth a reflexology postulate in 2003 based on recipient response. His conclusion: a surge of direct current bioelectricity (recharging torrent/surge of energy) can be directed throughout all 12 major meridians of the human frame by massive shock-type activation to either of these two reflex power-points. depending of thickness of musculature. At MIR this is 'shock-type' reflexology point activation is accomplished with either Nicole's REFLEXY Tool for self-help (reflexology wheel can penetrate deeply in order to create stimulus) or with Dr. Riley's Ultra Massager (DRUMmer) used in professional reflexology applications. Either of these means can help create the forceful activation to the K1 Meridian/Solar Plexus point needed to trigger the brain to discharge the negative direct current of regeneration into the deficient area of the body. The objective of this bio electrical recharging process is to help clear the interstitial space (space between the cells) of congestive mucoid debris, so that the body can begin to function more efficiently at the cellular level. In MIR's Home Study you will also learn of the twelve SOURCE points of each major meridian, half of which are positioned in the feet and the other half in the hands. Effective activation of each source points will create equilibrium automatically in that particular meridian. Dr. Felix Mann has assured Brinkerhoff that bio electric equilibrium can be established without the need to read/interpret the pulse (according to Chinese tradition). That could take years to learn. The SOURCE points will make this skill unnecessary ... if accurately and effectively activated. For the sake of simplicity it is enough for you to understand that equilibrium/homeostasis/physiological balance in your being can be attained through the K1/Solar Plexus point alone, when used in conjunction with the Photoluminescent Reflex Beamer's. After treating a recipient with the DRUMmer or other equally effective reflexology stimulus/activation device ... if a recipient is then exposed to sufficiently powerful radiant energy rays ... upon emergence from the sedation state the recipient will be in the aforementioned state. All this balance can be attained without pulse diagnosis or utilization of the SOURCE points. The whole process consuming no more than 5 to 10 minutes of hands-on time. 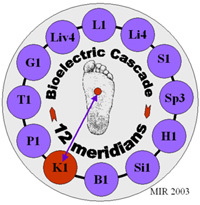 Hence MIR utilizes both the Meridian and Zone Reflexology concept. The activation of the K1/Solar Plexus point helps keep it simple for the beginner or in self-help applications. 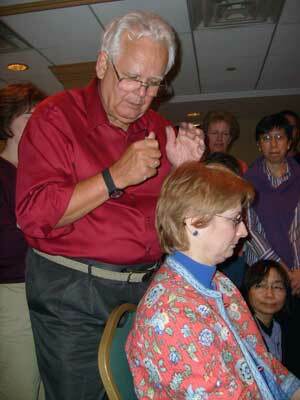 Use of the DRUMmer on the K1/Solar Plexus will give you professional results on your first effort at treatment. Such results are worthy of a remuneration ... a recompense .... a payment. That is how you can earn as you learn ... from the occasion of your first treatment. If you purchase the MIR Reflexology Starter Kit you can get started recording your hours of practice that employ your reflexology experimentation on yourself and friends ... right away. Reflex Therapy of the Hand is the point of focus in Korea. The above hand chart is an excellent reference when activation of the K1 needs to be backed up with specific points. Such a search is facilitated by Korean Hand Reflex Therapy. The level 1 chart shown above gives the basic concept, but the Level 2 charts lend themselves to accurate targeting of the corresponding meridian point with life-giving accuracy. However, even a simple pressure/compression massage of the fingers and extending the work onto both the Anterior and Posterior portions of the hand can itself alone give not only a sense of comfort, but release of sufficient DC of regeneration - the healing current - to produce genuine healing. The meridian points laid out on the hands form a microcosm of the 12 major meridians of the body - along with other special lesser meridians. They can be worked simultaneously with the corresponding meridian point on the body or as a stand alone point. These hand meridian points are specific, proven, and powerful. Geri and I want to thank you for all you have done to make our experience in Denver outstanding.We were enabled to share Korean Hand Therapy (KHT) with many new people because of your effort to encourage participation of MIR Graduates: which led to a successful seminar. We both feel very appreciative for your generous sharing of your wonderful percussion/radiant energy methods and the dynamic reflexologic work performed on us at MIR Clinic following our KHT Seminar. Thanks for being you and for your dedication to your healing mission. We look forward to future work with you and other MIR Associates. Dr. Dan Lobash instructs class in KHT. Below is a letter submitted by ReflexoCurist Susan Watson written by a medical doctor who was her patient. He experienced the value of Reflexology for alleviation of symptoms caused by repeated chemotherapies - a medical anti-cancer treatment - administered to him for lymphoma with R-CHOP. My purpose in writing this letter is to emphasize the importance of reflexology in oncology practice. This ancient healing art has been a blessing to me through the hands of Susan Watson, a local expert practitioner, who asked me to write to you. I have been recently treated for a lymphoma with R-CHOP, which caused immense discomfort. Through massage therapy, acupuncture and reflexology, I was able to withstand repeated chemotherapies. In particular, Susan was able to relieve pain, anxiety and eliminate a number of distressing abdominal symptoms. I also noted a consistent diuretic response after each therapy. I am aware of the misconceptions about complementary medicine among physicians; I was one of them before my illness. Although experiences such as mine are anecdotal, as you are aware, many oncology centers do employ practitioners in a wide variety of alternative disciplines. This healing art poses no risk to cancer patients unless there is a concern for bleeding due to thrombocytopenia. I highly endorse the teaching and practice of reflexology in your department. I believe most patients in your center will find the treatments helpful as an adjunct to their oncology therapy. Now you can give Tomorrow's Treatment Today. You'll get what you've always got." Here you see the 24 meridians plus the Conception Vessel Meridian; this runs right down the center of the body. The fountainhead of all the meridian points is CV-17; near the center of the sternum. When giving a treatment on K1; the recipients should work CV-l7 simultaneously with finger pressure or other appropriate device. 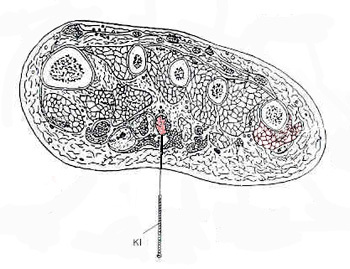 Plantar View of Kidney One Meridian location. This is the only meridian origin point on the bottom of the foot. Aka the Well Point; the Bubbling Springs Point; & Chinese Sleep Point. "high pressure" POM jackhammer to the K1. The DRUMmer will normally feel good, not painful; depending on the condition of patient & diameter of reflex tip. Graduate Nicole Schmitmeyer of Ohio displays Dr. Riley's Ultra Massager on board the Transcontinental Classroom in New Brennan, Ohio. "These are my twin boys working on their tootsies. You know, they haven't had a cold SINCE I have acquired this machine. No cough, no running noses ~ all round healthy boys. They work on themselves which is very convenient for me! Take care,"
Self Help in Action: "Hey Mom, its my turn now!" states Nicole's baby boy. 2001 employee party saw Zachary working 3 chairs, 3 Beamer's, and the K1 Point exclusively with the DRUMmer. In 5 hours he gave 41 treatments and made money too. "I had the energy to have worked another 5 hours, but the party was over." This 150 watt red near-infrared Photoluminescent Reflex Beamer is standard with both the Starter and Professional Kit as shown on this Web site.